A year or two before we went, my mum had the idea that one day we would go to visit Ethiopia. My brother and I were very excited but didn’t think it would be possible. I had seen a film about Grace in Bekoji and this inspired me to want to see her in real life. When my mum said there was a team going to Bekoji and we could join them I was SO excited! We raised money to go there by doing sponsored runs. I ran 5K and by brother ran 10K. People were very generous and we raised almost £1,000! On the way to the airport I couldn’t sit still; I was really looking forward to seeing Grace. At the airport we said goodbye to our dad and older brother and whilst waiting for our gate to open we had a delicious WH Smith meal deal. Addis Ababa was very busy and looked like a poorer version of London. On the journey down to Bekoji there were cows and sheep on the road and lots of potholes! I thought it was going to be very dusty but it was green and beautiful. The weather was in the low 20s but was colder in the morning and at night. Bekoji was much bigger than I expected and the people, much shorter and smiling. When I walked out of the guest house each morning at least 20 children from the school would surround me, wanting to hold my hand and say “What is your name?” I found it quite overwhelming. They all asked to do clapping games and said “One camera!” meaning, ‘take a picture of me!’ They all fought to hold my hand and I felt like I didn’t have enough fingers! But it was a good opportunity to be with them, love them and play. Whilst I was there I made lots of friends but I made four special friends in particular. Their names were Mihirat, Desta, Grace and Hawani. We played a lot on site in the playground where there was a roundabout, swings and a slide. We especially played on the roundabout and I got a bit dizzy! It was fun. We gave out lollipops and knitted teddies to the children in the school. They were so happy to receive one lollipop, even the older students and teachers. And the kindergarten class were overwhelmed with joy when we gave them teddies because they don’t have many toys and to receive a teddy was amazing! The kids there don’t have much, most of them only have one or two outfits. But they are all so happy. Here, in England, we always want more but there they are happy with what they already have. People in the village don’t have running water in their homes so we made some water filters to give them clean water. 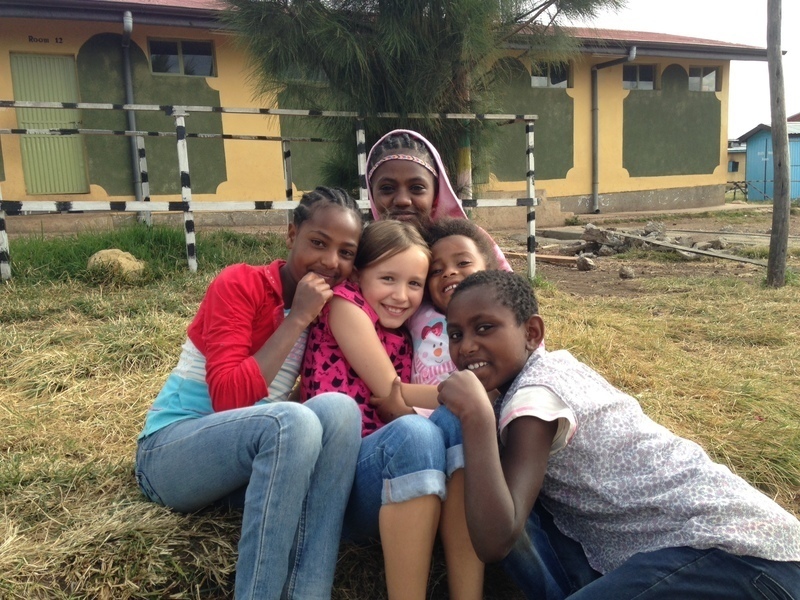 We painted them yellow, red and green – the colours of the Ethiopian flag – trying not to splatter it everywhere! It was a lot of fun. One of my favourite parts of the trip was spending time with Grace because she made me laugh and loved to dance and have fun. I really loved being with the team and playing with the kids and would love to go again one day. We agree with Amy that our kids are happy with what little they have and are so thankful for the support of their sponsors and of teams that visit them and help make their lives better. Amy’s willingness to hold hands and play with our kids helped them know that they are loved. They will never forget Amy and the joy and fun they shared together. Sameer is just 5 years old. When the earthquake struck brave Sameer took his little sisters hand and lead her out into the open fields. His small house was completely destroyed but we’ve been able to help him and his parents by building him a new house.